Running has taken over my life. I'm halfway through my training program for marathon #3, the California International Marathon, and am running the San Jose Rock 'n' Roll Half this weekend. I've been feeling really positive about my progress. Things I'm doing differently: being CONSISTENT. I know that no one is perfect, but it's no secret that I lacked discipline and consistency the first two marathons, and of course, this is a gamechanger. Consistency is key, not just in running, but in every aspect of my life. I'm being literal when I say that running has taken over my life, because every aspect of how I live has changed to help me be a better runner. Everything in health, fitness, and athletic performance is interrelated: as they say, you can't out-run a bad diet. But it's not just exercise and diet either, it's also how much you sleep, how well you hydrate, how stressed out you are. 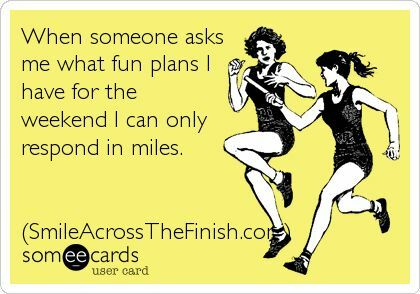 In order to perform well at the marathon, I have to make all my training runs, especially my long runs. To do all my weekday runs, I have to get up at 4:30am to run before work. To be able to get up that early on a consistent basis, I have to go to bed really early. To be able to go to bed really early, I have to make sure that I eat properly (things that don't upset my body) and at the proper time (not right before bedtime, if I can help it). So I have to plan my day so that I can do all these things, and of course, hydrate constantly. These ARE a lot of major changes for me, and I'm finding that... I don't really mind. I know there's a lot to be said in favor of small changes, things you can incorporate into your existing routine and are therefore more sustainable, but you know what? I have come to the conclusion that my existing routine was kinda crappy. I NEEDED to change, because if I were to continue doing what I was doing (sleeping 4-5 hours a night, eating stuff that my body didn't like, exercising inconsistently and then going all out and getting hurt), then I will continue experiencing what I was experiencing: constant illness, exhaustion, and depression. I feel awesome lately. I feel strong, confident, and energized. And most of all, I feel proud and accomplished. I'm fighting my demons one day at a time, and for now, I think I'm winning. I've sold my soul to the running gods, and I'm not sorry.